Sunny & Me on the Trail. Yes, my bib does hang down & I am always trying to read my map! As The Husband says, tl:dr - that is, "too long: don't read". For whatever reason, I really got detail oriented in this write-up, so if you don't want to know every thing that happened on this 19 mile ride, just read the summary. For those of you with some time, read on! 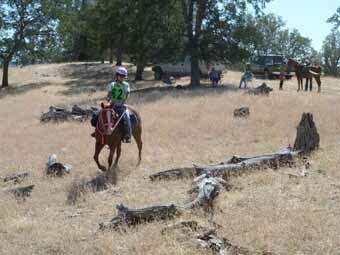 Executive summary: Sunny and I went to the NATRC ride at Cowboy Camp. It was stinkin' hot. We had fun anyway. 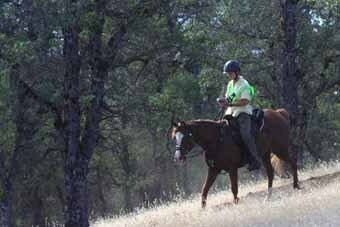 When this year's NATRC Competitive Trail Ride (CTR) schedule was posted, there were seven rides planned for Nor Cal, I think. However, this year was crazy; between the winter weather lasting into July in the mountains and the EHV-1 panic, rides got cancelled right and left - and when Sunny and I finished Jackson Forest, it turned out that we had managed to do all the rides (three!) thus far in the season, and there was only one left, Cowboy Camp. I love doing the rides, so I'd probably have gone anyway, but since it *was* the last one of the season, I was especially motivated because I'd be able to say that, for at least one year, I'd done every NATRC CTR in Nor Cal. Cowboy Camp is about 20 miles west of Williams, which is in the Central Valley on Hwy 5, between Sacramento and Red Bluff. The ride was one that had been originally scheduled for May, but got moved to September because of the EHV-1 lock-down. The reason it was planned for Spring is that it gets ungodly *hot* there in the summer and fall. So about three weeks before the ride, I took a look at the weather predictions for the area: 95 degrees, 97 degrees, 97 degrees, 98 degrees, 96 degrees, . . . And every time after that when I looked at the National Weather Service site it was the same - nothing under 95, lots over 100! Bonny Doon. I'm whinging to my friend Judy about not being able to find heat to train in. She says, "Come on up to our place - it's 93 degrees today!" 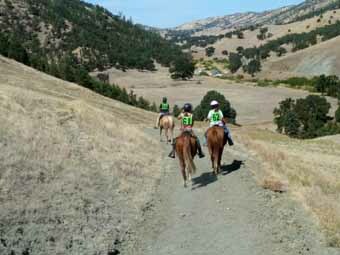 I throw Sunny in the trailer the next morning and drive to Bonny Doon. It's 65 degrees. We rode for 13 miles and never took our sweaters off. Sheesh! For those of you who don't know the area, those are all super-hot spots: Morgan Hill and Gilroy are in the Valley and substantial parts of both Calero and Mt Madonna are in "pockets" in the hills, where the wind doesn't reach and the heat just seems to pool. I would have said that running into temps like those in August and September at those places was impossible - just shows how wrong I can be. I finally gave up and decided that maybe I'd take my cool weather hoodoo with me to Cowboy Camp so all this worrying would be for nothing. 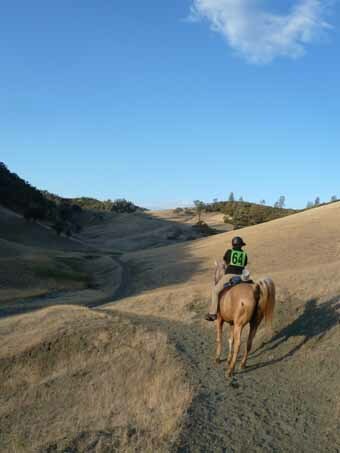 However, just in case my mere appearance didn't pull down the Cowboy Camp temps, I decided that Sunny would do hill work in lieu of heat work - I may not be able to find heat, but I surely know where the hills are. So that's what we did. It's a pretty long haul to Cowboy Camp and it was going to be hot, so I split the trip into two days. We left on Thursday afternoon and spent the night in Marybeth's back yard, then continued on to Cowboy Camp on Friday AM. We got there about 1:30 PM. My friend Laura, whom some of you know, had been up the previous weekend, marking the trails. She told me to park with my trailer tack room (the side I like to tie Sunny on) facing the road, which would make it shady in the afternoon. This was great advice, since people with truck thermometers were reporting temps between 105 degrees and 110 degrees! The temp on the next day, when we were to ride, was supposed to fall by 10 degrees, so it would only be . . . 100 degrees. Ah, only 100 degrees. Now I feel better. Note to self: I parked on the perimeter of ride camp, and Sunny was tied on the side of my trailer that did NOT face the rest of the camp. I had parked at a slight angle, so Sunny couldn't see Laura's horse, Tango, and she couldn't see any other horses who were in the interior of the camp. She survived, but she was definitely more on edge than she had to be. I think it would have been easier on her if I'd made sure she could see, as well as hear, other horses. Laura and Tango and Sunny and I roused ourselves to walk out to the river next to camp, about a half mile. Sunny enjoyed the drink, but Tango loved just being *in* the water: he got belly deep and madly thrashed with his front legs - water went everywhere. We were all refreshed by Tango's efforts, so we returned to camp, where we wilted again. As the sun went down, though, it cooled off nicely and by the time we had our ride meeting, it was comfortable. At the meeting, the ride manager announced that, due to the heat, the route was shortened for the Open and Competitive Pleasure teams, and Novices (that's us) got extra time to do certain parts of the ride. The "trailmaster" apologized for a three mile downhill with no shade - boy, did I not want to hear about that! After the meeting, I headed off to bed. Unfortunately, Sunny was up and alert pretty much all night, which means that I was, too. I think she thought she had responsibility for keeping the whole camp safe, otherwise why would she be stationed way out on the outskirts of civilization, not in sight of a single other horse? In any case, she was restless and, since all of my camper's doors, vents, and windows were open, I heard her every time she moved. It was a long night for both of us. The ride manager honked a horn at 5 AM so we could get up and get ready for a 7 AM start. It always amazes me how long it takes to get me together - we made it to the start on time, but just barely. Laura and I were planning to ride together and when we got to the Out Timer (the person who records the time you leave), there were a bunch of juniors waiting to start, including Carli and Jody, with whom we'd ridden at Jackson Forest. Laura and I were pretty sure that the girls wanted to ride with the other juniors, but the horses sort of made the decision for them: Hot Shot and Cayley were hitting the trail with Tango and Sunny. End of story. So we all took off together, with plans to try to split up a little on the trail. Oh yeah, before I left Santa Cruz, I had put Emma's rosette on Sunny's headstall to make sure I remembered to take it along - I moved it to my bib to remind me to Ride Like Emma. It worked for us at Jackson Forest, and I figured we needed all the luck and inspiration we could get at Cowboy Camp. The trail out was a skinny path through star thistle, which Sunny tip-toed through, followed by really tall grass - like tall enough so that I couldn't see anywhere but straight ahead. I was surprised that it didn't seem to bother any of the horses at all. After about a half mile, we came to a creek that we had to cross. All our horses stopped for a drink - smart ponies - and after we crossed we hit the trail system that we'd be on for the rest of the ride. The ride was on jeep trails, for the most part, so you could ride comfortably side by side, but you didn't feel like you were riding your horse on a freeway, and the surface was very nice. Almost immediately, we headed up hill. I think that climb went on for almost six miles, with just a couple of significant descents. When we started uphill, it was still cool, and there was even a breeze at some points. As usual this season, Tango was on a mission, so he led up the hill. I made Sunny stick with Tango, and we tried to get some distance on Carli and Jody, so they could have their own ride, but, again, Hot Shot and Cayley weren't buying it, so after a few failed efforts, we just settled in together. Fortunately, Jody and Carli are beautifully mannered adolescents, and didn't seem to mind riding with us. The trail wound up and up and up, with several "local maximums," that provided great views, and the vistas widened every time we reached a higher point. It was getting warmer and the trail was a pretty steady climb, with some seriously steep pitches in it, so we stopped to take in all the views and let the horses have a few minutes to huff and puff, which they were all doing. And Sunny was sweating like a pig, much more than the other horses, so I was a little worried - although she had much more of a winter coat than they did, too. 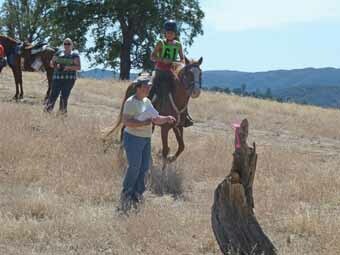 At about the six mile point, coming up a steep pitch of the hill, we saw Carol, the horsemanship judge, perched by the left side of the trail, and the photographer to the right side. Sunny was leading at that point, so she got nervous, but she couldn't decide which person to spook from, so she just marched straight up the hill. Whew! 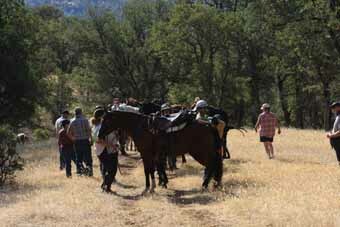 Since the horsemanship judge and the vet and the P & R (pulse and respiration ) crews all travel together, we weren't surprised when there was a P & R/vet check at the top of the hill, about 100 yards from the photographer. So Sunny and I entered the P&R area and got our vet card with our entry time on it. I dismounted, loosened Sunny's girth, and we got into the line to wait our 10 minutes. My job during this time is to make Sunny as calm as possible - which, in Sunny's case, means that I should ask her to put her head down - Marybeth's Horsey Yoga - and keep it there and I should just sit with her. Which is what I did. After 10 minutes, the vet check team descended on us. It took awhile - I think the fella had trouble believing the numbers, but he finally came up with 9 and 3; that is a heartrate of 36 bpm and a respiration rate of 12 breaths per minute. Whew! No more worries about lack of fitness - those are great numbers, particularly in the heat. The next challenge was to get water in Sunny. There had been another EHV-1 episode at an ACTHA event two weeks before our ride, so we all had to take precautions: the vet took all the horse's temperatures at check-in, and the owner's had to take it twice more on Friday, then pre-ride and post-ride on Saturday, and post the results on the side of their trailers. Another precaution was that no horses could drink directly from the huge water tanks management had for us, in order to prevent an infected horse from passing the virus via shared water. There were a bunch of scoops around each tank, and each rider was supposed to have their own collapsible bucket with them. 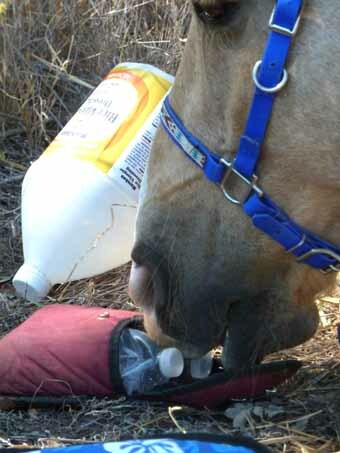 To get your horse a drink, you'd use the scoop to get water from the tank into your bucket, then your horse would drink from your collapsible bucket. Unfortunately, the buckets openings are about as big as Sunny's nose, and we hadn't had much of a chance to practice. Fortunately, she really takes care of herself, so once she realized that there was water in there, she was all over that bucket, and drained it twice. Another perfect job. After the P & R, we headed for the vet check. It's a frequent practice that the vets at these things will ask us to do a task that shows our horse's manners and our horsemanship, and he/she grades the horse's manners and reports on the rider's skills to the horsemanship judge. In this case, we were told to mount after we'd watered our horses, and ride down to a point and wait for the vet to call us. When he called, we rode down to directly in front of him and dismounted, testing the horse's ability to leave her buddies. He then did a more detailed check of Sunny: capillary refill, muscle tone, sensitivity, etc. He then had me trot Sunny, in hand, about 50 yards, then mount and ride away still further from her buddies. Sunny did really well, and we stopped about 50 yards from where we started to wait for the rest of our posse. After that, it was just three miles or so to lunch, where there was hay and water for the horses and whatever we'd sent out for ourselves. I'd filled my cooler with carrots and sweet feed, so Sunny had her choice of food. We got 45 minutes for lunch, so we pulled their saddles and ate our lunches with the horses. The only excitement was when Tango realized that Laura still had a horse cookie in her saddle bag, along with her water bottles and he decided to go after the cookie. The 45 minutes went by really quickly, but we managed, as a group, to leave on time. Directly out of lunch, we had to do this long climb up through a canyon - it was the hottest it had been all day, and it was a couple mile climb. We finally made it to the top and started descending. Pretty soon we could see horses hanging out ahead of us, then we could see that they were gathered around a pond. Well, Tango *flew* to the pond and marched in. Then he marched in deeper. Then he dropped and started to roll - all this with Laura on his back! Laura convinced him not to go all the way over, but, in the meantime, he'd been an example to all the other horses and they were *all* cavorting in the pond - wandering around in it and splashing away. We spend probably 15 minutes at the pond getting good and cooled off, but then we had to take off. The next P & R was at about 14 or 15 miles, I think, and we had to trot the last maybe quarter mile into it, but Sunny pulsed down really quickly again. After we passed the P & R check, we had to walk our horses, in hand, to the vet for him to check them out. When he completed his exam, he said, "You have 15 seconds to get on this horse and get out of here. Go!" It was pretty unexpected: NATRC things are usually very deliberate, but I trotted over to a log, Sunny stepped up to it, and I hopped on. We must have made it okay because it didn't show up as a deduction on our vet card. We then proceeded to the Carol, the horsemanship judge. She had us walk through a little obstacle course made of downed logs - over this one, around that one, over another one between two ribbons, stop here . . . - then we were free to take off on the last leg of the ride. Sunny and I were first through the vet/horsemanship check, so we waited for the others. When we were all gathered, off we went. It was mostly a descent, so the next two miles went really quickly - and we arrived at the Two Mile Point. 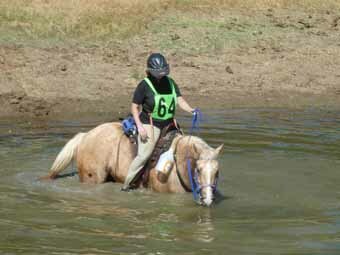 In NATRC rides, you have to have "forward motion" from the Two Mile Point to the end of the ride. The reason for this is that the judges *could* decide to have a P & R check right at the finish. If some teams got just short of the end, then stopped for ten minutes and let their horses rest, then walked over the finish line, but other teams didn't stop at all, it wouldn't be a fair comparison of the horses' fitness. Note: It seems like I'm spending a lot of time explaining NATRC rules in this post. Sorry! On this particular rule, I can almost hear someone saying, "But you shouldn't be penalized for setting your horse up to win; the riders who stopped and rested were just thinking ahead." I think the issue with that line of thinking is that the metabolic measurements are counted toward the *horse's* score, not the rider's - so it might be true that the rider should get credit for good management, but it wouldn't allow for consistent evaluations of the horses. Anyhow, we had gotten ahead of the minimum time and, in NATRC, you are penalized for every minute you come in *before* the minimum time and for every minute you come in *after the minimum plus 30 minutes* - they are a lot more worried about "Yee Haw!" riders than they are about slowpokes like Sunny and me. (And I know - yet another rule explained!) Sooo, we joined a pretty large group killing time, waiting until they'd be able to do a comfortable pace and make it to the finish somewhere between the minimum time and minimum time plus 30 minutes. 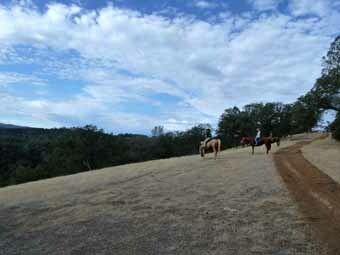 The Two Mile Point was at the bottom of a hill, and we had to cross a dry creek bed to continue. (I haven't mentioned it, but we must have crossed 15 dry stream beds - this would have been a wet ride if it had been in the Spring!) The creek bed was full of just-slightly-larger-than-base-rock rocks and a couple of horses immediately picked up stones in their hooves, including Tango. You're supposed to carry a hoof pick on these rides, Laura was, and she was able to remove the stone immediately. The other horse had a *huge* rock wedged between his shoe and his frog and his rider couldn't get it out, and she was really prying, enough to be moving the shoe. Finally, Kay Leibernecht, who is a NATRC mainstay (she's written a few articles for the Region 1 website, including a great one on how to introduce juniors to NATRC) and a farrier, got off her horse and gave it a try. She said that she's learned that, in some cases, the right approach is to apply a lot of force really quickly, instead of the slow pry. Kay positioned the hoof pick and really jumped on it and out popped the rock. Another lesson learned. Finally, we took off, thinking that we had waited plenty long. What we didn't take into account was that the horses knew where camp was and that we were close - they all took off like they were late for their coffee break. Jody and Hot Shot ended up saving us: we put them in front and told Jody to show us how slow a Quarterhorse could go, and she was able to get Hot Shot to maintain a stately 1.7 mph pace. None of the other horses were happy about staying behind Hot Shot, but we were able to keep their noses aligned with each other's butts and adhere to Hot Shot's superb example. We finally got to the creek we had to cross on the way out and the horses stopped for a looooonnnnng drink of water and some splashing around and we were able to just walk in the rest of the way. Sunny was definitely glad to get back to the now-shady trailer, get her saddle off, and settle into some alfalfa and water. I got her cleaned up and took a shower. I hadn't turned on the hot water heater in the camper, so it was a sort of cold shower and it felt GREAT! We vetted out when it was our turn and came back to the trailer. By this time it was cooling off, so Sunny and I both drifted off until it was time for the awards. I was happy to finish and to be able to say that we did ALL the rides in Nor Cal. There was a pretty large contingent of Novices, so I didn't have much expectation of success. However, it turned out that there were only two Lightweight Novices - the rest were mostly Juniors - so Sunny won Novice Best Horse. At the very end of the awards, they announce the Sweepstakes horses - at this ride, "Sweepstakes" is best horse in class, so in our class, Novice, it was the horse that received the best overall vet score, a combination of metabolics, soundness, attitude and manners, from among the Novice Junior, Lightweight, Middleweight and Heavyweight entries. And Sunny won it. AND she won it with a perfect vet card! We must have been doing *something* like Emma!